This page will automatically take you to the new version at http://www.wsu.edu/~campbelld/amlit/rowlandson.htm in 2 seconds. Teaching Rowlandson's Narrative from the Heath Anthology site. King Philip's War: Culture, Gender, and Historical Implications. This American studies class project at Georgetown discusses the war's background and legacy in relation to Rowlandson's narrative. Note: This is an older site, and many of the links are dead. Recent pictures of and commentary about the sites associated with Rowlandson's journey. Brief biographical background on Rowlandson. Brief account of the war from historyplace.com. Pictures of various editions of Rowlandson's Narrative. (image courtesy of Maribeth Miguel's page at the University of Texas, a site no longer available). 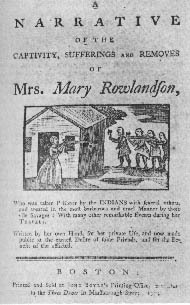 Mary Rowlandson was born circa 1637-1638 in England. With her parents John and Joan White, she sailed for Salem in 1639. Joseph Rowlandson became a minister in 1654 and two years later he and Mary were married. They had a child, Mary, who lived for three years; their other children were Joseph, b. 1661; Mary, b. 1665; Sarah, b. 1669. At the time of their capture, the children were 14, 10, and 6. In 1675 Joseph Rowlandson. went to Boston to beg for help from the Massachusetts General Assembly, during which period Mary Rowlandson was captured. After her redemption, the couple lived in Boston and then moved 1677 to Wethersfield, Connecticut. Joseph Rowlandson died 24 November 1678 after preaching a powerful fast-day jeremiad. Mary Rowlandson remarried 6 Aug 1679 to Captain Samuel Talcott. He died in 1691; she lived until 1710. Disgrace later came to the family: her son Joseph got his brother-in-law drunk and sold him into servitude in Virginia. While a prisoner, Mary Rowlandson travelled some 150 miles, from Lancaster to Menamaset then north to Northfield and across the Connecticut river to meet with King Philip/Metacomet himself, sachem of the Wampanoags. Next she traveled up into southwestern New Hampshire, south to Menamaset, and north to Mount Wachusett. According to Katherine Derounian-Stodola, "Introducing her work in all four 1682 editions was an anonymous preface to the reader, signed only 'per Amicum' (By a Friend), but almost certainly written by Increase Mather. In 1681, Mather had proposed to a group of Puritan ministers that they collect stories of 'special providences' concerning New England to be evaluated, sorted, and eventually anthologized. Quite probably Rowlandson's narrative was among the providential accounts he received, but owing to its length, local currency, and intrinsic worth, he may have suggested separate publication and agreed to help. . ."